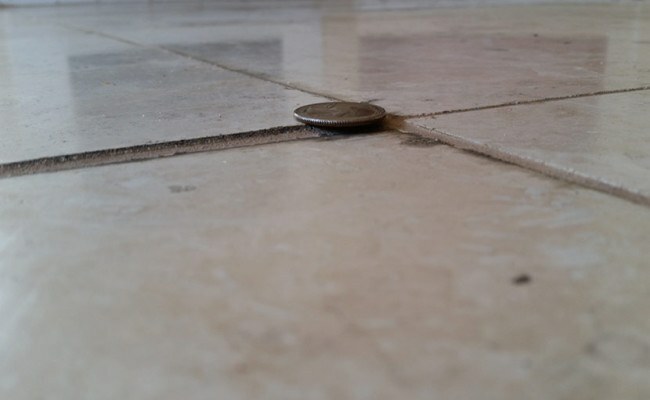 In the first image, you can see what happens when a natural stone installer sets tile unevenly. Notice the shadow underneath the coin? That’s not supposed to be there. Not only is this kind of shoddy installation work a trip and fall hazard, but it gives the floor an unsightly appearance. 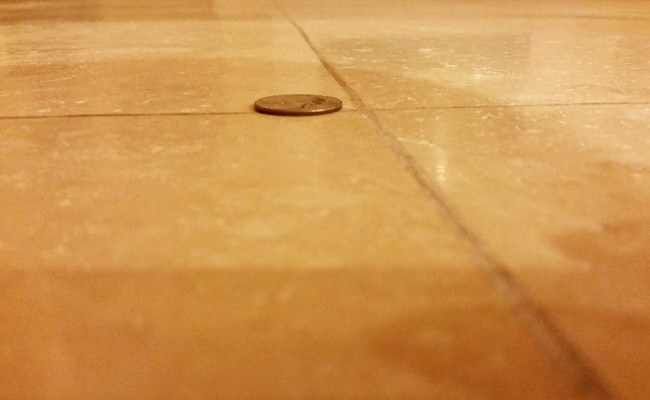 The last thing these Rancho San Diego homeowners wanted to do was replace the entire floor. Thankfully, such errors can be corrected at a fraction of the cost of replacement with our natural stone restoration services. First, we performed a level grind to the entire floor, using a 50-120-220-400-800 grit diamond grinding process. Then we filled any holes with epoxy and ran a 3m polishing pad over the entire floor. The floor looked perfect. In order to maintain the beautiful, clean, uniform appearance, we applied natural stone sealer to protect against staining. As you can see in the second image, it is possible to fix a bad installation! If your natural stone was not properly installed or if it has become damaged, professional stone restoration is the answer. Don’t have it replaced, have it restored. You will be amazed at the high-quality results a skilled stone restoration technician can achieve. Contact us online or call 619-246-0240 throughout the San Diego area to request an estimate for professional stone restoration services to repair a bad installation.